The stunning Hepburn combines the traditional elegance of formal living and dining rooms with the casual flair of a spacious family room - made even more dramatic by a grand, optional, window-rich sunroom or conservatory. A spacious open kitchen with island/breakfast bar offsets a sunny breakfast room. This 2,600 sq. 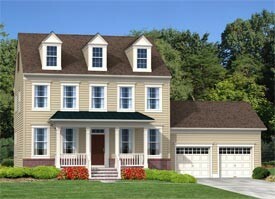 ft. plan offers four bedrooms - including a spacious master suite that features a luxurious four-piece bath included.